Have a look at the latest Kickstarter update for our backers! We thought we’d share the good news from here on our site with everyone. 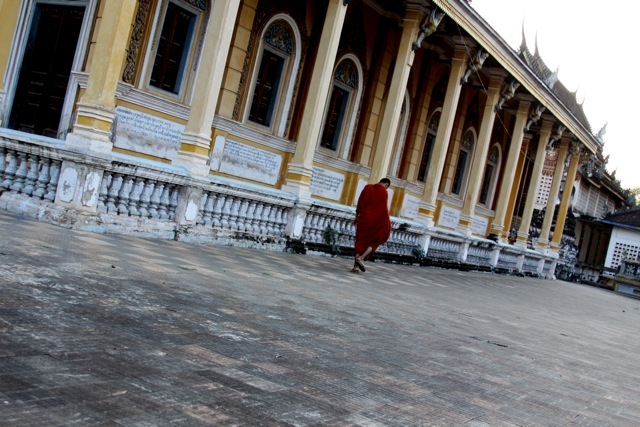 Stay tuned for more images and updates on goings on in Battambang soon. P.S. It’s really hot right now. Really. 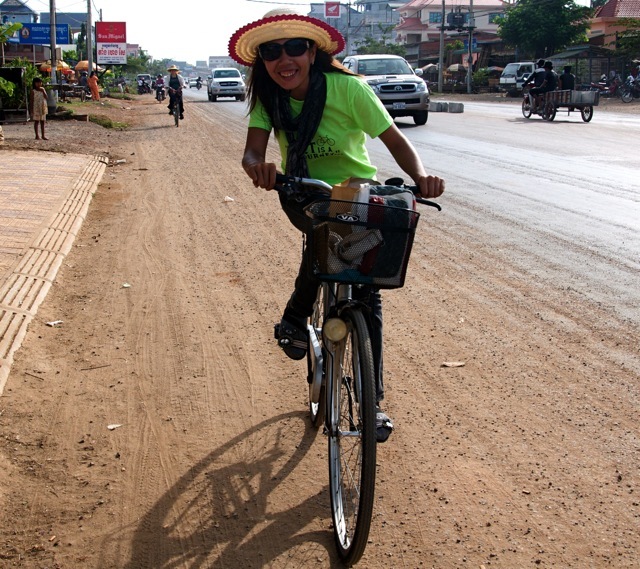 Come to learn about an affliction that affects a high number of amputee victims in Cambodia. Stephen will introduce an innovative approach to healing Phantom Limb Pain, or the pain amputees experience in the limbs they no longer have, with a simple technique called Mirror Therapy. He’ll also give a personal account of his experience with phantom pain, as he is an above-the-knee unilateral amputee. Learn exactly what phantom pain is, where it stems from and see a hands-on demonstration about Mirror Therapy in action, and the short and simple protocol of what amputees or caregivers must do to ensure success. Participants will gain exposure to the excruciating existence of phantom limb pain (over 90% of trauma-based amputees – ie: landmines and traffic accidents) and to the availability of an incredibly simple, effective, non-narcotic cure that requires no clinics, hospitals, doctors, drugs; a cure that’s virtually free and doesn’t carry the danger of addiction (unless you really, really, like to look at yourself in the mirror). Stephen hails from Vancouver, a logger, fisherman, photo model, fisherman again and hobo-drifter for life. First a ski racer and then a road cyclist, where he developed his life-long passion. Stephen lost his left leg above the knee in a hit-and-run motorbike accident about 8 years ago near Siena, Italy. His injuries were manifold and he spent some time in a coma. Shortly after the amputation and various other procedures, he began to experience a harrowing intensity and frequency of Phantom Limb Pain bouts. This continued, more or less unabated, for a full four years until he finally took a tiny gamble and bought a mirror to begin Mirror Therapy. After five easy weeks of self-treatment he’s been pain-free ever since. Over 10,000 limb amputations have been done in Cambodia since 1979 – and who knows how many before that. Many of these people are suffering today and Stephen, with his experience and his breakthrough treatment is in a unique position to help them. He is so grateful that he has taken it on as his duty, and is his great and priceless pleasure to bring this technique to others that might have have little hope of discovering it otherwise. 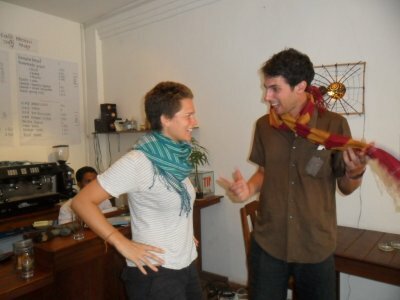 He’s since lived in Vancouver, Afghanistan, Southern California, Berlin, Baja, Saudi Arabia and is now working with various NGOs and caregivers in Cambodia. He also had the ultra-rare experience of being involved in the making of a movie based on my own life. It was a Warner Bros Germany film (thus in the German language) and is called Phantomschmerz or ‘Phantom Pain’. Here’s an English subtitled clip: Phantomschmerz (English Subtitles). He is hoping that his having been so many places and done so much since his accident will inspire energy and motivation in at least a few of the amputees that he has met on this ‘mission’. Monday February 27th at 6 – 7 pm; about one hour plus question and answer. 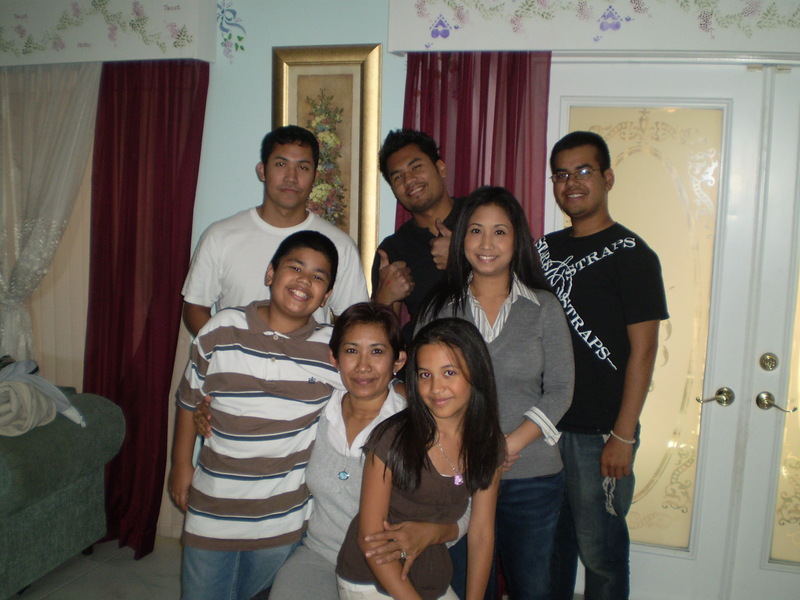 Anyone and everyone including local Khmer amputees. This is a unique and valuable opportunity for information about phantom limb pain and mirror therapy techniques to reach the local NGO community, ex-pats and Khmers alike. The talk is for a broad audience and we’re hoping to have a variety of people with different backgrounds in the room – everyone is welcome and encouraged! Kinyei is looking for a volunteer to hang out with us, experience Battambang, and work alongside a Khmer team from January to March, to plan, organize, and host the first ever Trampoline Unconference in Battambang, Cambodia. 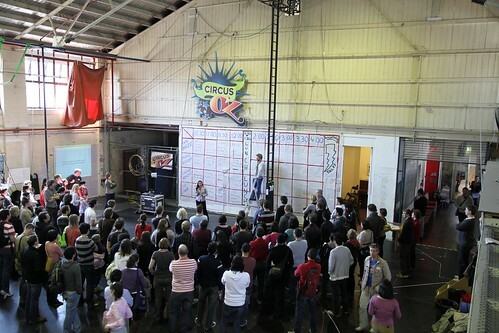 Established in Melbourne, Australia three years ago, Trampoline is an unconference driven by participants who share what they find amazing. There is no specific topic – indeed, the goal is to share ideas from all different disciplines, industries and walks of life. Cambodia is just beginning to explore the benefits of unconference type gatherings. 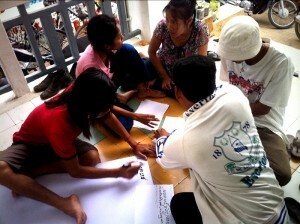 Young changemakers in Phnom Penh and Siem Reap have facilitated and participated in a range of idea exchange forums the likes of TedxPP, BarCamp, and smaller break off gatherings. It’s an exciting time here, there is an energy and a charge that is palpable. As a catalyst for Trampoline Battambang, you’d get to witness the first of these idea exchanges in a community full of potential. Thus you’ll have the opportunity to play a key role in getting this new event happening in Battambang, and encourage the spirit of social innovation, sharing and community in Cambodia. And because we need you located here with us, you’ll also get to experience the relaxed charm of Battambang while the weather’s at its best. You will be working with a Khmer team to translate the Trampoline idea into something that fits the local context, and providing event planning and communications support. You’ll be putting your skills and talents to use for other Kinyei projects as well. We’ve got Trampoline pencilled in for late February or early March 2012. Language training, mentorship and guidance will be provided by the Kinyei team – who don’t lack for experience in both attending and running Trampolines – so will you have plenty of support as you hit the ground running. This is a volunteer position and thus there is no wage. Send an email to Pat (pat at freelancing-gods dot com) for more details about why you should come to Battambang. 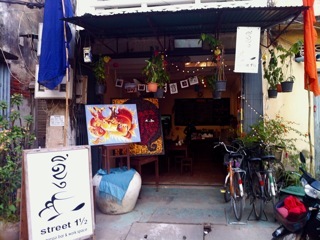 We’re fast approaching our one year anniversary at Kinyei’s St 1.5 Cafe! 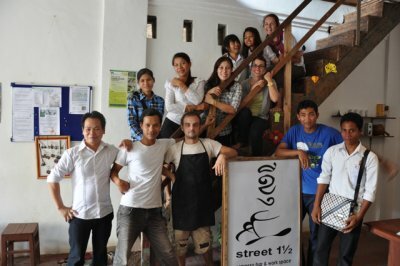 Incredible to think that it’s been one year since we launched our Kickstarter campaign to get this whole thing off the ground, ran a remote training with our green staff and the Jasper folks, and opened our doors in Battambang. There hasn’t been a minute to sit still so far; looking back at the past two months, it’s been a frenzied push to expand our team and into our upstairs space. We’d like to think these last several months have been a testament to the team’s hard work and endless energy for fulfilling Kinyei’s collaborative spaces a making the most of every opportunity that presents itself. We kicked off October with another round of hiring to ready ourselves for the tourist season, nearly upon us. 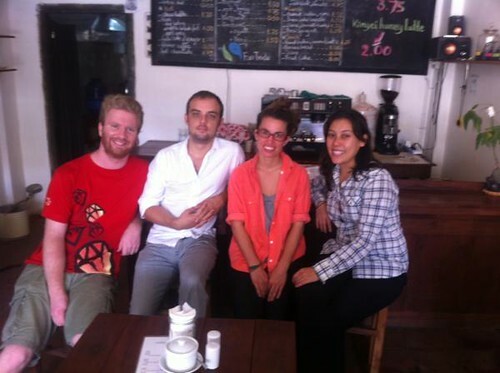 Theavy, Sopheap, Seyla and Chouert, the cafe newcomers, are quickly acclimating to cafe life. Fortuitously, Kinyei was hosting volunteers James and Joel, pals from Australia, on site for 2 weeks around the same time (see post below for their blog). James, a coffee connoisseur with years of experience in the coffee industry back in Brisbane, used the two weeks to pass on his expertise. James, with help from Katie and the Cafe team, developed a comprehensive Barista training manual and accreditation course, with a coffee appreciation component, covering coffee concepts from crop to cup. Untac also incorporated YouTube instructables into the training himself, citing how helpful it was for him when he was learning to use YouTube to watch different milk steaming techniques. To be sure, making delicious espresso takes persistence and passion! Kinyei’s senior Cafe staff also attended a train the trainer workshop led by the Women’s Reproductive Team from the Catholic Centre in Battambang at Kinyei. Perfect timing for the team to use their new training skills as we rolled out the Barista training curriculum to staff from cafes around Cambodia. Soksabike tour guide Moth Pheap was happy for the chance to view experienced trainers to get ideas for leadership style and setting clear direction and focus to a task. Sopheap Khou appreciated that the trainers spent time to understand their audience, and become familiar with those they were going to train, including cultivating a friendly feeling between instructor and student. 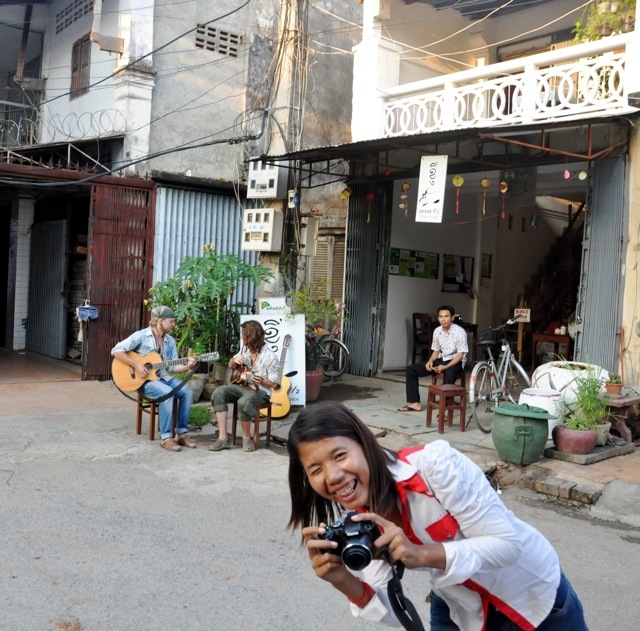 Phalla Yai pointed out that the training was just a first step, and that with limited time, there was limited potential for learning – she’d like to see more trainings like this in the future. 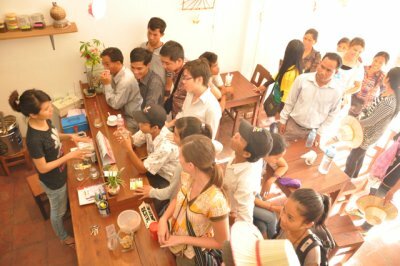 It was fun to see Kinyei’s different project teams come together to learn a general skill like leadership and training that they can bring back to their specific jobs, and use in peer to peer education whether that’s training new baristas in the cafe, new tour guides on the route, or any other hobby, interest or skill that they have. Thanks again to Meg Battle, Theary and the team from the Catholic Church for putting together a super workshop! On the 20th of October Katie, Sean and Sakana crowded into a shared taxi to Phnom Penh to cheer on Untac in the 2011 Barista Championships at the Sofitel. On the 21st of October Untac had 15 minutes to make and serve 12 coffees. He made four espressos, four Cappuccinos and four signature drinks. 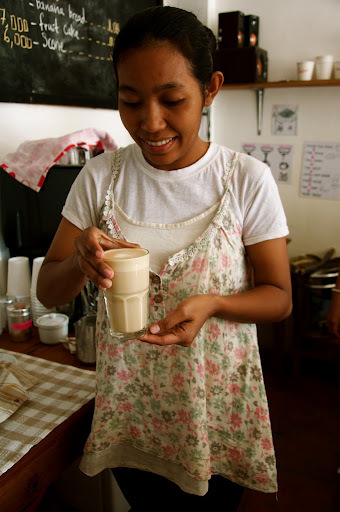 With help from fellow cafe staff, Untac concocted the ‘Kinyei’; a shot of espresso, a shot of ginger sugar syrup, latte milk and cinnamon sprinkled on top. The ‘Kinyei’ was served in a piccolo latte glass. 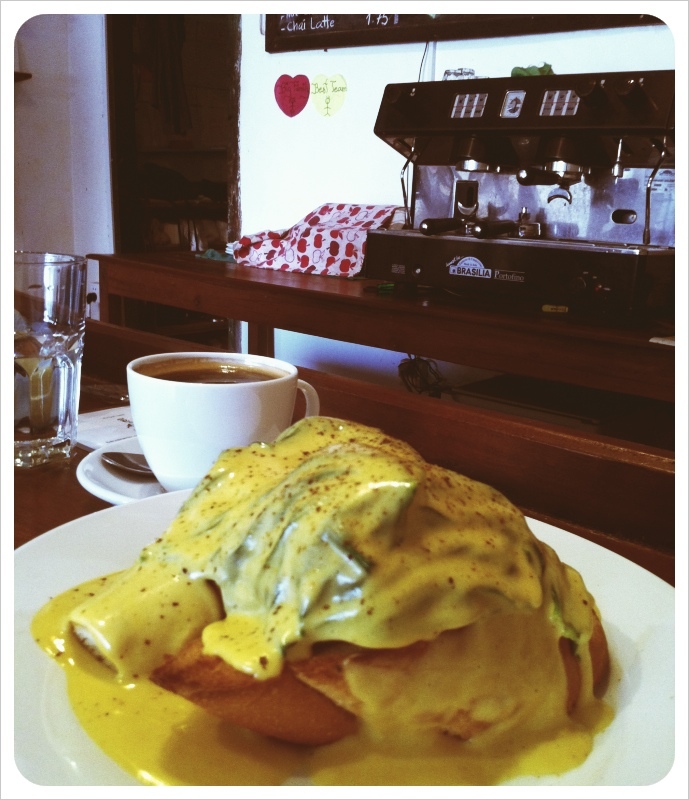 Delicious…and innovative! Katie, Mel, Justin and I got the pleasure of tasting the ‘Kinyei’ during Untac’s practice round the day before the competition at St 1.5. “The three who won were very skillful, all the competitors have skills, but did worse during the competition, even me”, Untac noted. He attributed this to the nervousness all contestants felt, as none had been judged before. He also noted that there were two different machines and that the contenstents were randomly assigned to compete on; the participants all agreed the larger 2 Group Saaco machine was more optimal than the smaller single group machine. It was luck of the draw. 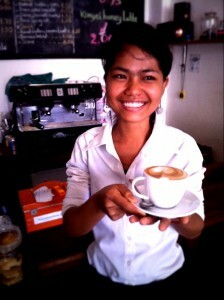 The crowned barista was from The Shop in Phnom Penh. Talk about steep competition, most of these baristas are churning out hundreds of espressos daily. 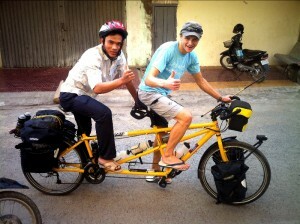 We’re terribly stoked for Untac, he did us all proud in Phnom Penh! “The cafes in Phnom Penh are similar to Kinyei, but I got some new ideas about specials. 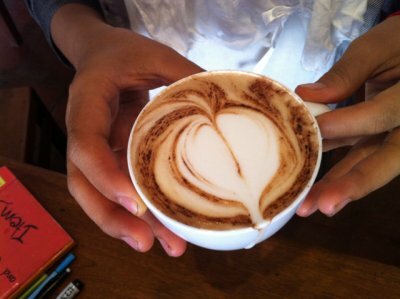 At Kinyei we could have something like Banana Cappuccino”, Sean reported. “I was very happy when I watched Untac to make coffee, some time I want to help but this is a competition so I cannot”, lamented Sean. “I think next year Kinyei should send two baristas to compete” Sakana concluded. We couldn’t agree more. An aside: Lucky for the team, the event was held as part of the CRA hospitality competition. You can imagine our elation as we witnessed competitors in the bedmaking, fruit carving, and bartending competitions. for an energizing desk space, and everything in between. Thus the office has picked up and relocated a mere 10m south on St.
to encourage remote workers coming from near and far to check it out. *We absentmindedly left out that it was our dear friend and former Battambang resident, Alison, that made this move possible! Alison was our neighbor on St. 1.5 until she moved to Phnom Penh for work. She gave us the heads up about her fantastic property, and we jumped on the opportunity to rent. Thank you, Alison! We sure miss you and best of luck in Phnom Penh! Have a glance at the new spaces here. Expert Barista and IT vols – James and Joel spent a few weeks with our team in early October. Hop over to their blog to hear about their time, and follow the rest of their Southeast Asian adventure.